That turned out to be a very long day. We got to the Canberra airport at about 9:15am on Saturday 6 July and did all the necessary checking in and waited an hour or so before we boarded our plane to Sydney. In Sydney it was all a bit of a mad scramble. What on paper sounded like we had a bit of time all but vanished by the time you transfered to the international terminal, checked in to the next flight, went through security, immigration, and then make your way (run) to the end of the terminal to make the last boarding call. Flight departure 1:50pm Saturday 6 July. Anyone I have traveled with in a car can attest to the ease at which I can fall asleep when sitting in the passengers seat. I often joke that when Deb takes over the driving I’m asleep by the time she’s hit second gear. So it came as a bit of a surprise that in the flight to LA I probably only slept for a bit over an hour. With the aide of a tail wind we made the 12 odd thousand km journey ahead of schedule and touched down at 10am Saturday 6 July. The advantage of being at the back of a 747 plane is that you are close to being the last one off the plane, the last one to join the cue at immigration, the last one at customs. But your bag is going around the belt nearly by itself and looking lonely. Before we left Australia people had told me that Americans knew what the word service meant. Our first real experience was the lovely young fella that organised or transfer to our hotel outside of LAX. Everything was no bother. Now that’s how you create an impression.! By the time we checked into our hotel in Beverly Hills it is a bit after lunchtime so rather than crashing we decided to try and get lost by taking a public bus to the Santa Monica Pier. What could possibly go wrong! I was ready for the cars all being on the wrong side of the road but you don’t realise how ingrained your habits are until you start walking against the pedestrian traffic on the wrong side of the footpath, or getting on/off the bus, or looking the wrong way to cross the road. 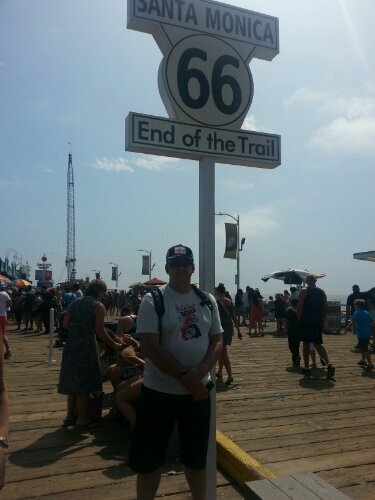 When I told people that I planned a ride while over here everyone, well nearly, asked whether I was doing route 66. No, but I did find the end of it today which will be the closest I come. Unless I get really lost! The pier was nice (I’ll post photos later as I really only used the slr down there) with lots of interesting characters, but it was wall-to-wall people! By the time we got back to the hotel, finally got the phones up and going and had a bit to eat for dinner it was 8 pm. So by the time we crashed at 9pm on Saturday 6 July we were stuffed. By my calculations our Saturday went for over 38 hours. July 7, 2013 in US.